This easy-to-carry soft side portfolio has comfort grip handles and an adjustable shoulder strap. It’s an alternative nylon portfolio to the traditional portfolio that provides additional storage. The secure closures offer protected storage areas. 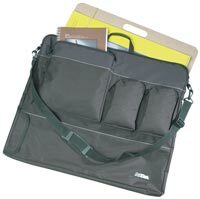 The main compartment can hold an 18” x 24” sketch pad and clip board while exterior pockets are available for additional supplies. Overall dimensions of the artbin tote folio are 27-1/2" x 23-1/2".